In 2012 I received an email from Billy Reid’s organization with an interesting proposition. It seemed that Natalie Chanin and Billy Reid, both fashion designers based in Florence, Alabama, were experimenting with growing organic cotton in a small field near Trinity, a town between Decatur and the Shoals area of Alabama. The email asked for volunteers to come out to the field to help weed – no small task when you’re growing organic. Natalie Chanin’s Florence-based label, Alabama Chanin, features handmade garments made with American-grown organic cotton. The problem is, there is no organic cotton grown in Alabama that she can use and she has to source her cotton from some place in Texas. The purpose of the Trinity experiment was to see what kind of luck they’d have growing their organic cotton locally. 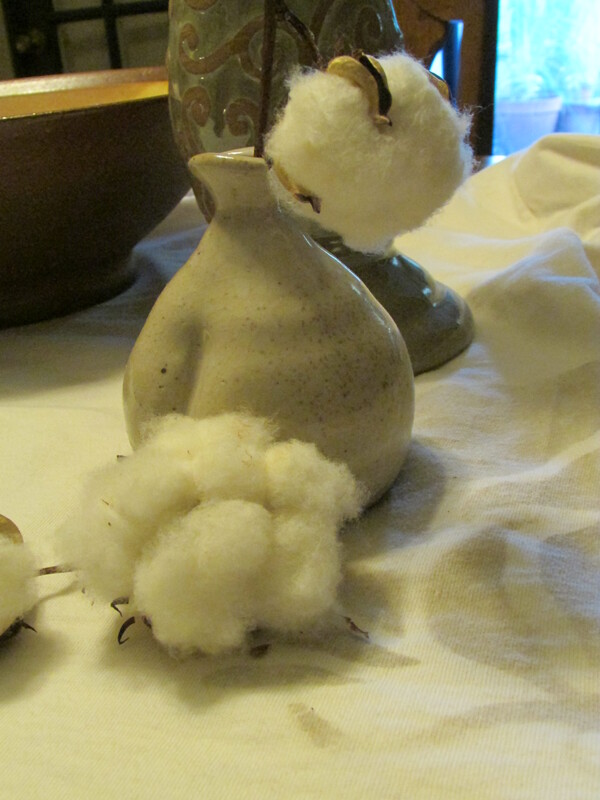 A September 5, 2014, edition of The New York Times “T” magazine blog chronicles the Alabama Chanin cotton harvest. Back in 2012 I heeded the call out of curiosity and because it isn’t every day that one is invited to weed in a fashion designer’s organic cotton field. I drove to Trinity one sunny Saturday morning and the only other person in the field that morning was Lisa Lentz; she and her husband had lent the project the seven acres to plant the cotton. I didn’t have too much time to spend in the field that morning but I weeded hard while I was there and learned more details about the project from Lisa. I had worked in a cotton field once before; when I was a young boy, on a visit to Cullman County, Alabama, with my mother and grandmother, my Cullman County cousins got a kick out of putting their skinny city cousin in the field for a while with a sack over his shoulder. I wasn’t very useful out in the field that morning but I remember it was rough on the hands and hard work to remove the cotton and place it in the sack. It was equally challenging to pull weeds in Trinity in 2012 but I drove away with a sense of accomplishment, sore knees, and a curiosity about how the experiment would work out. There were subsequent appeals a few weeks after my morning of weeding for volunteers to pick the cotton ready for harvest. I had conflicts that kept me from going back out but was glad I had a connection to the project. A friend, when I told him I had spent a morning weeding organic cotton, smirked a little and asked how organic cotton clothes would feel any different from any other cotton clothing. I was surprised he asked that since he is very environmentally conscious and fuels one of his vehicles with recycled cooking oil. I explained that it wasn’t so much the feel of the cotton but the toxic chemicals that were not going into the earth and the water supply that mattered. In July of this year, I was at the Alabama Chanin Factory for a Friends of the Café event and asked Natalie Chanin about the status of the Trinity organic cotton project. She told me the finished cotton was in the factory being turned into tee-shirts. When the tee-shirts went on sale a couple of weeks ago, I had to grab one. It may be the most expensive tee-shirt I’ve ever owned, but I definitely feel I had a hand – and knees – in the effort. And, back to my friend’s comment about what difference organic cotton makes: It’s likely all psychological – but it is probably the most comfortable tee-shirt I’ve ever put on my body. This entry was posted in Alabama, culture and tagged Alabama, Billy Reid, culture, Natalie Chanin, organic cotton on September 22, 2014 by gedwardjourney.